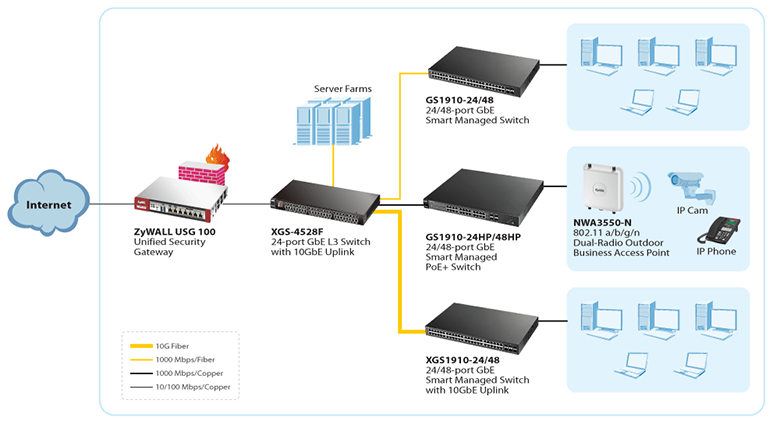 The Zyxel XGS1910/GS1910 Series 24/48-port GbE Smart Managed Switch is smart switches with optional 10GbE uplink for maximum throughput to fulfill increasing network demands for Small and Medium Businesses (SMB). The Series consists of six models—XGS1910-24, XGS1910-48, GS1910-24, GS1910-24HP, GS1910-48 and GS1910-48HP—that provide 24/48 10/100/1000BASE-T PoE Plus or non-PoE copper ports. The XGS1910 models provide 2/4 10GbE connectivity for uplinks. The XGS1910/GS1910 Series is ideal for securing 10/100, Gigabit and 10GbE connectivity; it also offers IEEE 802.3az, access security, advanced prioritization, traffic-monitoring capabilities and a fanless design. Meanwhile, the Series supports smooth IPv6 migration for future expansions. As a result, the XGS1910/GS1910 Series is suitable for fulfilling SMB network needs with cost-effective, valuable frameworks. The Zyxel XGS1910/GS1910 Series consists of full-featured GbE Ethernet switches providing comprehensive Layer 2 switching capabilities such as Access Control List (ACL) rules and 802.1AB LLDP and LLDP-MED, etc. The Series delivers the essential network features for businesses with easy-to-use management at a right price. That is, the XGS1910/GS1910 Series is the best Edge switch range for small- and medium-size businesses to build high-performance network efficiently. As operating overheads such as electric bills increase constantly due to the rising green awareness, businesses have to avoid unnecessary energy waste. The built-in IEEE 802.3az Energy Efficient Ethernet (EEE) features of Zyxel XGS1910/GS1910 Series can reduce energy consumption of Ethernet devices through defining low-power modes and adjusting the operating timeframe to help saving the related costs effectively. Meanwhile, although IEEE 802.3af is insufficient for providing power to large-scale network deployments or high-power devices such as outdoor Wi-Fi APs, IP cams and IP phones, fortunately the Zyxel GS1910 Series features IEEE 802.3at PoE Plus with up to 30 W power per port to flexibly extend network deployments. 802.3at PoE Plus makes the switch ideal for connecting numerous powered devices to form a flawless business network. Ready for the future 10 Gigabit Ethernet, the Zyxel XGS1910 Series collocates 2/4 10GbE connectivity for uplinks that allow SMBs to deliver higher bandwidth for congestion relief and smooth data delivery. Furthermore, 10GbE Gigabit uplinks to desktops also allow businesses to become highly efficient IT environments for secure, smooth daily online operations. Download the Zyxel XGS1910/GS1910 Series Datasheet (PDF).